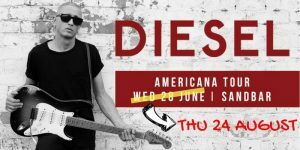 The Diesel performance scheduled for June 28 at SKYCITY Darwin has now been postponed to August 24. Diesel will perform with John Farnham, Jimmy Barnes and Noiseworks on June 28 in Melbourne. This is a “playing it forward’ benefit show to support Diesel’s longtime friend Stuart (Chet) Frazer, a founding member of Noiseworks. Chet was diagnosed with lung cancer last year. This concert will raise funds for Chet’s Help A Mate appeal as well as donating much needed funds to the Olivia Newton John Wellness Centre and Support Act.